This site is dedicated to the visual and written history of the Rasmus and Stine Rasmussen family. Rasmussen1889 is used because that is the year the Rasmussens moved to America from Denmark because they were hungry. (5 kids: Elena 1898, Mae 1900, Ernest Lloyd 1903, Walter 1906, Agnes 1910). Wheelwright Rasmus Rasmussen, born in Ringe, Denmark, near Svedborg (on the isle of Funen) was 50 years old when he, together with his wife Mette Kirstine who was 40 years old, and their six sons: Rasmus (Ras S.) 16 years, Hans Kristjan (Christian Hans) 11 years, Jens Elo (James E.) 9 years, Marius Alexander (Maurice “Morse”) 7 years, Frederik Vilhelm (William “Will” Fredrick) 4 years old, and Kristian Frederik Karl (Carl) 1 year, left for Alden, Minnesota on May 23, 1889, and eventually homesteaded in Egeland, North Dakota. Mads Peter/Hans Peder (Peter) Born July 9, 1875 – died September 16, 1888 – age 13. The family moved to America because they were looking for a new way of life. They were tired of the heavy taxes imposed by the King of Denmark and they were hungry. From Carlene Severson: Once again, Thank you Lloyd. Every time you send pixs I stop everything to look. This is a very busy day and here I am looking at pix. It’s really not your fault, but I can’t stop myself. There’s one of Lorin’s dad standing by old iron wheeled tractor with 2 ladies on tractor. I just love it. I’ll probably be making some identifications for you. From Carlene Severson – From the Ras line: This is just amazing. I’m so grateful for all of you who are making an effort of pass on this amazing family heritage to future generations. Don’t know if I told you before, but a few weeks ago God put a scripture in neon for me. 122 years after the Rasmussen family arrived on these shores from Denmark, Rasmus Rasmussen’s great great grandson, U.S.N. Lt. Jason Harrel, flew his F-18 over the Reagan Presidential Library, on February 6, 2011, in honor of President Reagan’s 100th birthday. Lt. Harrel is stationed on the aircraft carrier USS Ronald Reagan. 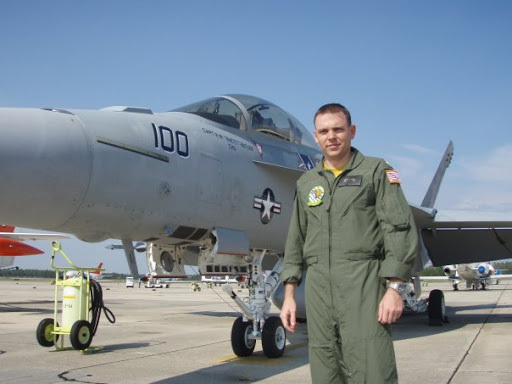 Norma Rasmussen Harrel’s grandson: Lt. Jason Harrel in front of his F-18. 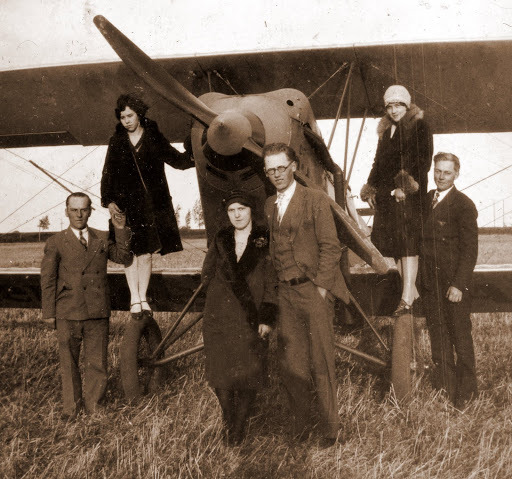 Then…about 80 years earlier we have a photo of Jason’s great uncle Vernon and great aunt Nellie Rasmussen standing in front of an OX-5 powered Travel Air 2000 airplane that probably landed at Egeland. A recent South Medford High School graduate has endured two emergency surgeries after he was shot this week while serving in Afghanistan. Cody Smith, who graduated in 2009 and played on the football team, is able to communicate with nurses at a hospital near Bagram, an ancient city about 60 miles north of Kabul, according to his father, Chris Smith. Smith was shot in the abdomen by insurgents while taking part in an operation in the northern section of Afghanistan, his father said. Smith was scheduled to leave the war zone and head to Germany, but doctors in Afghanistan determined he was unfit to travel until after the second surgery. Smith joined the Army immediately after graduating from South Medford and has served in the 101st Airborne Division since 2009. Smith has been in Afghanistan since May 2010 and was scheduled to come home in April this year. His family received word of his wounds Thursday. Chris Smith knew something was gravely wrong when he answered his cell phone and saw the area code was from Smith’s Army base in Fort Campbell, Ky.
“It was hard to answer that call,” he said. The family operates the Wilderness Trails youth ministry camp based in Medford. As a child, Smith loved the outdoors and participated in the camp. He has been a member of the Applegate Christian Fellowship in Ruch since he was a child, his father said. Smith is the youngest of three siblings. Chris Smith said the family has been received overwhelming support from friends and the community. When Army Pfc. Cody Smith returns home this summer for the first time since a rifle bullet struck his lower back in Afghanistan, instantly paralyzing his legs, the former South Medford High School standout football player will know the community hasn’t forgotten him. Volunteers plan to build a handsome new studio apartment with wheelchair access and other amenities added to the classic 1913 Craftsman-style home in Ruch where he spent his childhood. “We feel Cody Smith is in the same class of people who stormed the beaches of Normandy,” explained Rush Behnke of Medford, one of the local contractors helping to organize the builders, carpenters and others in the effort. Normandy was the site of the D-Day invasion by the Allies on June 6, 1944, during World War II. Cody Smith, 20, the son of Chris and Vicki Smith of Ruch, is currently at the U.S. Department of Veterans Affairs hospital in Palo Alto, Calif., where he has been undergoing physical therapy and other medical treatment for the past two months. Nearly two dozen contractors and suppliers already have volunteered their services and materials. “We have an army of men and women ready to help,” Behnke said. Members of the soldier’s family say they are overjoyed with the show of support for their son by friends and strangers alike. In addition to two older siblings and his parents, the soldier’s local family includes grandparents Jack and Pat Smith of Jacksonville. The well-liked Smith family operates the Wilderness Trails youth ministry camp in the Applegate Valley. Cody participated in the camp and has been a member of the Applegate Christian Fellowship in Ruch since he was a youngster. A soldier in the 101st Airborne Division, he was shot in the lower back on Feb. 17 of this year, the bullet shattering a vertebrae. Cody Smith underwent surgery twice in military hospitals in Afghanistan before he was sent to Walter Reed Army Medical Center in Washington, D.C., where he spent six weeks. He was transferred to California two months ago. Noting that his son was in top shape when he was shot, his father said Cody has some movement in his thigh muscles. “For his condition, he is doing awesome with his spirit and attitude,” he said, adding that Cody’s positive attitude makes it easier on the rest of the family. “There is always hope,” he said of Cody’s ability to regain his ability to walk. Plans call for the existing family room, bath and dining area in the home to be remodeled to create a one-bedroom studio apartment. It will include a new bathroom with wheel-in shower and a bedroom with a sitting area and a closet accessible by wheelchair, Behnke said. “We’re hoping we can go further to buy things that will make his life better,” Behnke said. Army Pfc. Cody Smith of Medford is battling back after being wounded in Afghanistan. The 20-year-old, now in Walter Reed Army Medical Center in Washington, D.C., has begun eating his meals instead of being fed through tubes, according to his father, Chris Smith. A standout football player at South Medford High School, the soldier in the 101st Airborne Division was shot in the stomach on Feb. 17 during Operation Northern Avalanche in Kunar Province in northern Afghanistan. The bullet also nicked or bruised his spine, family members said. “It’s too early to tell,” his father said of his son’s prognosis. “He is only 12 days out from laying in the dirt from Afghanistan. “His spirits are better, but he probably still has a long road of rehabilitation to go, and we haven’t gotten into rehab yet,” he added. Noting that he has seen soldiers with worse injuries in the medical center, Chris Smith said he remains optimistic about his son’s future. 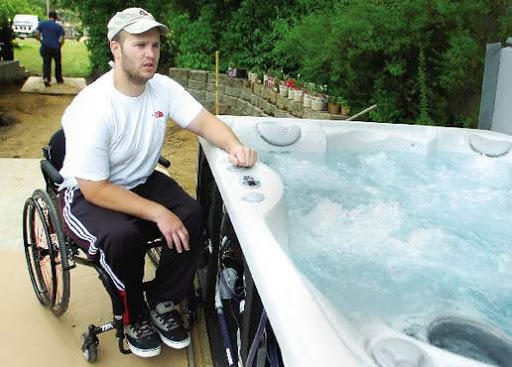 “Cody Smith was operated on twice in military hospitals in Afghanistan before he was sent to Walter Reed. South Medford football coach and teacher Bill Singler said he remembers Smith’s positive influence in high school. Cody Smith joined the Army immediately after graduating from South Medford and has served in the 101st Airborne Division since 2009. He has been in Afghanistan since May 2010 and was scheduled to return home next month. In addition to two older siblings, and his parents, Chris and Vicki Smith, the soldier’s local family members include grandparents Jack and Pat Smith of Jacksonville. “People need to realize there are kids fighting for our country, and some of them are from our home towns,” Chris Smith observed. The Smith family operates the Wilderness Trails youth ministry camp in the Applegate Valley. Cody participated in the camp and has been a member of the Applegate Christian Fellowship in Ruch since he was a youngster. Chris Smith indicated the family has received lots of support from friends and the community since their son was wounded. “A lot of people are praying for him, rooting for him,” he said. RASMUS RASMUSSEN was born December 10, 1837, in Fyen, Denmark. 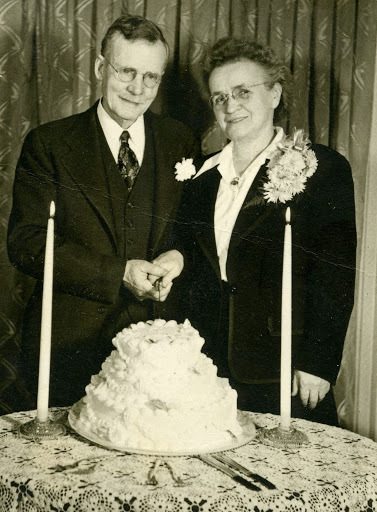 He died April 28, 1924 in Kalispell, Montana – age 85 years.METTE KIRSTINE “STINE” MADSON and Rasmus Rasmussen were married in Denmark – 1871. She died October 1910 in Kalispell, Montana – age 61 years.The family arrived in Minnesota in 1889; homesteaded near Egeland, North Dakota in 1895; moved to Kalispell, Montana in 1902.Rasmus and Mette “Stine” Rasmussen’s 7 sons were all born in Sødinge, Fyn, Denmark. In the photo from left to right starting with the youngest. Kristian Frederik Karl (Carl) – March 27, 1887 – December 18, 1959Frederick Vilhelm (Will) – August 16, 1884 – June 18, 1965Marius Alexander (Maurice “Morse”) – March 18, 1882 – Nov. 30, 1954Jens Elo (James) – August 23, 1879 – August 24, 1968Hans Kristjan (Christian Hans) – May 22, 1877 – April 15, 1952Rasmus (Ras S.) – May 15, 1873 – Jan. 8, 1952Number two son Mads Peter/Hans Peder (Peter) – b. July 9, 1875 – died September 16, 1888 – at the age of 13 in Denmark. Cause of death unknown. Father Rasmus Rasmussen – December 10, 1837 to April 28, 1924 Mother Mette Kirstine “Stine” Madsen August 2, 1849 to October 19, 1910The family photo was taken about 1902 as some of the family prepared to move from Egeland, North Dakota to Kalispell, Montana in 1902-1903. Obituary of Rasmus Rasmussen – April 29, 1924 from an Egland, ND newspaper. Found in the papers of W.F. Rasmussen, his youngest son, in 2010, now held by g. granddaughter Carol DeKorte. Rasmus Rasmussen, aged 85 years, died of old age at the home of his son (Christian H. Rasmussen) in Kalispell, Montana, on April 28th. 1924.Mr. Rasmussen was born in Denmark on July 10, 1838 and at the age of 33 years he married and to this union were born seven sons. He came to the United States in 1889 settling in Minnesota where he lived for six years, then moving here (Egeland) and homesteading on what is known now as the A.G. Campbell farm and part of their land being where Egeland now stands. In 1902 he moved to Flathead, Montana and has made his home in that state since.The deceased leaves to morn his death six sons who are: Will and Rasmus of this city; James of Spokane, Washington; Maurice of Coeur d’Alene, Idaho; Carl of Big Fork, Montana and Chris of Kalispell, Montana.Funeral services were held on May 2nd and the remains were laid to rest in the Conrad Memorial Cemetery at Kalispell, Montana. Five of his sons attended the funeral. Will being the one who was unable to attend.He was a man of generous impulses and never forgot the hospitalble ways of the pioneer. The stranger, even though a beggar, never failed to find food and shelter if he sought it at his hands, and he was at home by the bedside of the sick and delighted in all kinds of neighborly offices. He had borne adversity bravely and enjoyed properity quietly. He had filled the various relations of life, as son, husband, father, brother, friend, and filled them well. Who can do more? Let us introduce ourselves. My twin brother, Larry Smith and I (Lloyd Smith) are from the Christian Hans Rasmussen line. The relatives I am contacting are from either the Ras, Christian, Will, or Maurice’s (pronounced “Morris”) lines since Peter and Carl had no descendants. Jim and Annie Rasmussen had three children, but no grandchildren.